Not everyone can afford to give you the full value when you’re selling diamonds in Orange County. For most dealers, after you factor in overhead, regional limitations and lack of honesty in many, you’ll be lucky to get a fraction of what you could get at OC Gold and Coin. Factor in our free appraisals and generous education, and you’ve got yourself a great deal. Take it! If you have gold and precious metals you want or need to get rid of, there isn’t a better place in Orange County to sell diamonds to than OC Gold and Coin. In addition to expertly authenticating your gold jewelry, the professional jewelers at OC Gold and Coin are sure to arm you with the knowledge you need to sell diamonds in Orange County for the maximum cash payout – which is exactly what they’re worth. 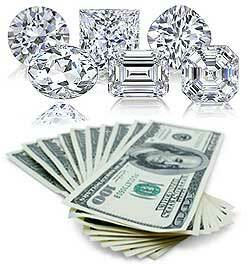 Come on in and get the true value of your diamonds before being undersold by anyone else – we’re here to help!